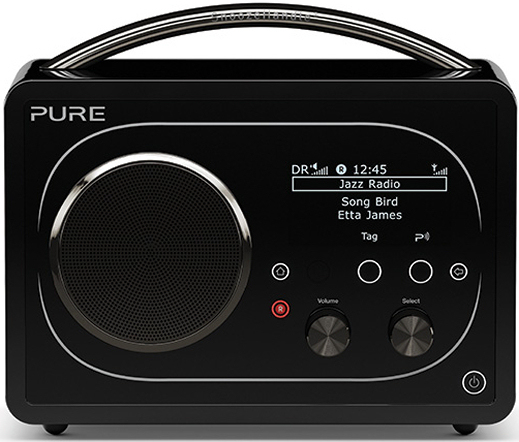 With the explosion in smartphone ownership and the mass of radio apps available to download, it's a welcome return to DAB and internet radio supporter Pure, who have launched their Evoke F4 DAB, FM and internet radio. While all-singing mobiles and tablets can certainly do the job, a dedicated receiver that isn't interrupted by incoming calls or Facebook notifications is a boon to even the most casual listener, with the added advantage of great sound and Pure's music streaming service. NOTE (Feb 2015): The firmware inside the Pure EVOKE F4 has been updated to ensure the radio can stream the BBC's high quality radio streams and access all on-demand ("listen again") content. The Evoke F4 comes with Bluetooth A2DP connectivity, allowing you to stream music to the unit from your 'phone (or PC/Mac and iPad). The radio works wirelessly with a broadband connection, but an optional dongle allows a hard-wired connection to your router. There's access to Pure Music for £5 a month and a long list of 20,000 worldwide radio stations to choose from. Or, if you prefer to keep things terrestrial, a DAB and FM tuner is fitted, so you can tune in to stations broadcasting from home. A quirky touch is the addition of a USB socket with one-touch recording facility and there are timers to allow scheduled recordings. You can also simply leave the radio on record while you pop out - a 2GB memory stick will hold about 15 hours' of audio, ready for your return. There are even alarms, with Pure's curvy "snoozehandle" silencing the alarm sound. A headphone socket and 3.5mm jack for adding a matching speaker are located 'round the back. Information is kept ticking on the high contrast OLED screen and with 7 Watts RMS on tap, there's enough oomph for The Archers in the kitchen. The radio measures in at 210 x 175 x 110mm and is a sturdy 1.5kg, wrapped in a real wood casing. Its rechargeable battery pack is available separately for around £35 - as is the matching speaker for the same price. The Evoke F4 pairs with the company's Jongo multi-room speaker system, letting you listen to the same station or music stream all over the house. The Evoke F4 is available now at £180 - check the left-hand column to find out where to get your hands on one.